Event Schedule – Hello Again, Dolly! 4. Preston Pittman lecture on The Historical Antecedents of HELLO DOLLY! Come learn about the fascinating history and background, the many variations and versions of this timeless theatrical creation which dates back to ancient Greece. May 19 at 5:00 pm at the Putnam History Museum. 7. COMMUNITY FREE PARADE DANCE REHEARSAL: Come practice your moves with ace Choreographer SUZI MYERS TIPPA. June 9. Philipstown Rec Gymnasium. 107 Glenclyffe Drive, Garrison, NY 10524. 3:30 – 5:00PM. 10. 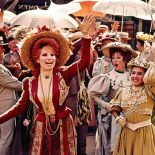 Outdoor Screening of restored Hello, Dolly! Film. Location: Garrison Landing Park on the river. Please bring your own beach chair or blanket for movie viewing on the park lawn. This is a FREE event hosted in part by the Cold Springs Lions Club. Date: Saturday, June 16, 9pm. 13. Behind The Scenes with Christopher Radko. Get the inside line on what it took to bring this multi-million dollar movie to life, the impact it made on our community, and the historical context of the Hudson Highlands, with Festival director and exhibition curator Christopher Radko. June 23. Putnam History Museum. 5 pm. Tickets for this event are $10. 18. Beacon Historical Society Presents: “GENIUSES BEHIND THE SCENES” with Christopher Radko. Get the inside line on what it took to bring this multi-million dollar movie to life, the impact it made on our community, all the talents beyond the obvious stars, and the historical context of the Hudson Highlands, with Festival director and exhibition curator Christopher Radko. On the heels of its 50th anniversary, guest speaker Christopher Radko will present a “behind the scenes” talk on the making of this multi-million dollar movie, the impact it made on our local communities and the historical context of the Hudson Highlands including BEACON, NY. He will share anecdotes, rare photos and a recording of Barbra Streisand’s experiences making the film. Mr. Radko is the Hello Again, Dolly! festival director and exhibition curator at the Putnam History Museum where you can see a display of historical photographs, original movie costumes, set designs, and memorabilia. Find out about Beacon’s role in the making of this film! Join us on Wednesday, September 26 for an interesting history talk and reception at St. Andrew’s Church next to BHS headquarters at 15 South Avenue, Beacon, 7:00pm. Free and open to the public. 22. AUTUMN SCHEDULE: Guests and Events to be announced, including educational museum events and talks, Hollywood costume lecture, student events at our local schools, and conversations with additional actors from the film Hello, Dolly! More good to come! !